We started our day by meeting with Saul Singer, a co-author of Start-Up Nation: The Story of Israel's Economic Miracle. Nearly every meeting we have had on the trip manages to mention the book. Saul, and Daniel Senor, his co-author, have managed to write the magnum opus of Israeli start-ups. Start-up Nation made it onto the New York Times bestseller list and has been translated into 27 languages. Saul believes that this shows that people, around the world, are interested in figuring out the secrets behind Israel's success. The secrets, throughout this trip, have been repeated and realized - a culture that encourages risk taking, failure, questioning authority. 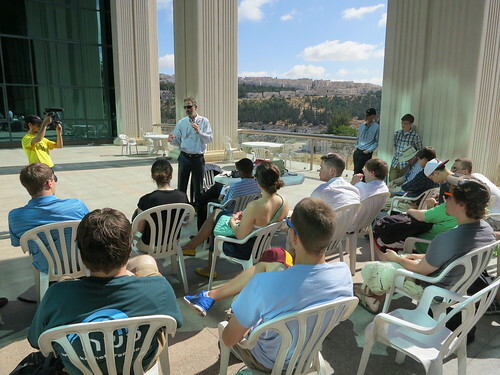 We started our day by meeting with Saul Singer, a co-author of Start-Up Nation: The Story of Israel's Economic Miracle. Nearly every meeting we have had on this trip managed to mention the book. Saul, and Daniel Senor, his co-author, from our interactions, have written the magnum opus of Israeli start-ups. Start-up Nation made it onto the New York Times bestseller list and has been translated into 27 languages. Saul believes that this shows that people, around the world, are interested in figuring out the secrets behind Israel's success. The secrets, throughout this trip, have been repeated and realized - a culture that encourages risk taking, failure and questioning authority, among many other things. Saul believes that every nation can be just as innovative as Israel if they adapt their culture to create the right environment for start-ups. He does not think the cultures of entire societies need to become more risking taking or less hierarchical. Instead, there needs to be space for subcultures that do have these traits. The culture in the Silicon Valley is very different than that of greater America. For example, some venture capitals in the Silicon Valley don't ask for forms or business models. Founders are asked to sketch out their ideas on a whiteboard and field questions. These would seem peculiar in the greater American corporate culture. In the same way, any country has the potential to be a "Start-up Nation" by creating the right ecosystem. Next, we walked across the street to the R&D center for Mobileye. 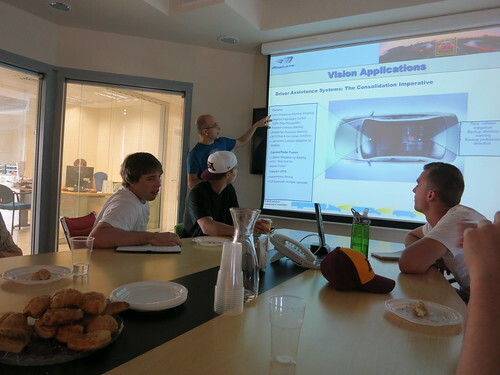 At Mobileye, Dr. Gaby Hayon, the VP of R&D, gave a presentation of the technologies behind Mobileye's products. The company uses a monocular camera and many advanced algorithms to create a product that will increase the safety of cars. One of the innovative ideas is that, when a car is in motion, each frame the video camera records will be taken from a different point in space. This removes the need for stereoscopic cameras because, by tracking points in a frame, a parallax can be created. This gives the Mobile Eye products a depth image. 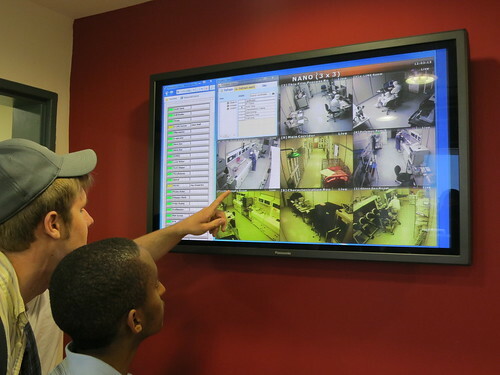 The depth and RGB image, like PrimeSense, are run through algorithms that make the device "see". The big difference between PrimeSense and Mobileye is that one is focused on understanding gestures and minute movements while the other is quickly analyzing a situation for dangers on the road. This is the result of Mobileye's hard work --- a system that can track and classify the pedestrians, walls and bicycles that surround a car. 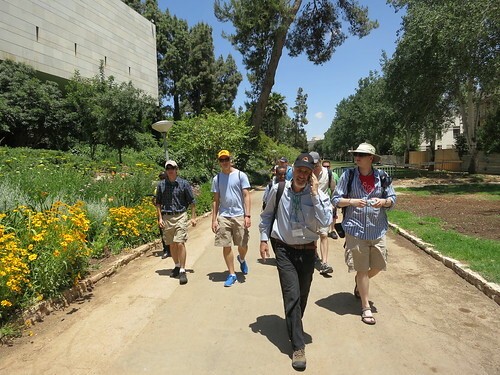 From Moblieye, we crossed the city to get to the campus of Hebrew University. Hebrew University, to some, is thought of as "the third temple". The first temple, in Judaism, was built under King Solomon and was destroyed by the Babylonians. The second temple was built under Cryus The Great, renovated under King Herod and was destroyed by Romans in 70 AD. The university comes from the vision of the Zionist movement. The idea, roughly, was that Judaism had evolved greatly in the 2000 years since the second temple was destroyed and constructing a university was a better reflection of the society they wanted to build. Not to mention, Al Aqsa and the Dome of the Rock had already been built on the Temple Mount. The opening of Hebrew University, in 1925, predates the state of Israel. At Hebrew University, we visited The Center for Nanosciences and Nanotechnology. We peered into the clean room through the glass walls, toured the facilities and met with Dr. Nadav Katz. We discussed, with him, the research that Hebrew University was currently under taking and the structure of The Center for Nanosciences and Nanotechnology. In the afternoon, we drove from the university, in Jerusalem, to the ILSI-BioMed Conference, back in Tel Aviv, at the InterContinental David Hotel. Many startups, established companies, and a variety of other organizations had booths (I even spotted a booth for the Embassy of Sweden!). The visits today connected directly to those early in the trip. We were prepared to ask tough questions and probe into the mind of Saul Singer because we kept hearing his name during the last week. The amazing technology PrimeSense meeting prepared us for the equally advanced work at Mobileye. The Center for Nanosciences and Nanotechnology was very different yet similar to the Nanotechnology Lab at Al Quds. Even the Biomed Conference had a connection -- we saw the application of the networking and venture capital scene in Israel. All of us are connecting the dots for ourselves and seeing how a well organized trip can make ones mind pivot. We are the same, yet, different from when we left the Minneapolis Airport. Exactly what this means in our life when we return remains to be seen -- I think the impact will be great.